Save Money with Easy Cloth Wipe Solution Recipes! We've collected recipes for cloth wipe solutions because we think you'll have more fun trying out different recipes instead of spending lots of time searching for them. If you know of a great recipe we don't have listed, please send it to us and we'll add it! By the way, these cloth wipe solutions work great for cleaning sticky hands and messy faces as well as dirty bottoms. I have started making my own wet wipes for my 16-month-old daughter due to sensitive skin issues. I am using baby wash cloths right now. Before I did this I had to buy expensive sensitive skin wipes. I am so grateful for your tips and solution recipes. So far I am hooked on making my own wipes. She is getting so much cleaner, has no rashes, and I do not worry about what I am putting on her skin. Thanks! EO: (Essential Oil) Added for antibacterial and/or aromatherapy purposes. The type and amounts of oil, soap, EO and water that goes into a recipe is what gives each cloth wipe solution its own distinct "personality". Have fun trying different recipes until you find the ones that you like best! I am not an expert in essential oils, so please do your own research before using essential oils in your cloth wipe solutions. A recent report suggests that certain essential oils may be endocrine disruptors, however, other research claims otherwise. More information about essential oils can be found at Bath Heaven, Aroma Web, A World of Aromatherapy and other great sites on the Web. Some mamas have reported that baby oil caused their diapers with microfleece inners to repel, so use with caution. First of all, please use common sense and keep all wipe solution ingredients away from your child. You may not think that these everyday products can be dangerous, but some infants have suffered respiratory problems after aspirating baby oil. When mixing solutions we've found that it works best to start with water, then oil and finally soap. By starting with water you'll avoid making tons of bubbles, and the oil will coat your measuring tools so the soap slips right off. Use a bottle with a pull-up spout (like on bottled-water bottles) to dribble solution onto the cloth wipes. Warm solution and place in an insulated container to provide warm wipes for baby. Place the solution into a commercial baby wipes container and dip cloth wipes into the solution. Place cloth wipes in a commercial baby wipes container and pour wipes solution over wipes. A commercial baby wipes container can be placed in a wipes warmer to provide cozy warm wipes for baby. Don't store solution or wet wipes for a long time because they can become musty and the wet wipes may even grow mildew - ewww! Check your solution and wet wipes daily, and mix smaller batches of solution frequently instead of large batches less often to avoid mustiness. We mix fresh solution once a week, store it in a bottled-water bottle, and have not had any problems with mustiness. *Please note: Tea Tree Oil should be diluted because pure Tea Tree Oil may cause a reaction in some people. Wikipedia has more information about Tea Tree Oil. And check out 11 Amazing Uses for Tea Tree Oil for even more ways this oil can be used. Steep the tea bags in the hot water then add the oil. Omit vinegar if baby has a raw rash. Similar to the other anti-fungal recipe, but less vinegar and water. This basic recipe can be adapted by changing the type of soap or oil. Dr. Bronner's Castile Soap comes in several yummy scents! Brew the tea, add the honey, and drink any leftovers! This recipe features a cloth-diaper-friendly diaper rash cream. Thanks to Tausha D. for this recipe. Thanks to Jamie D. for this recipe. Warning: This recipe may cause repelling and absorbency issues for diapers with synthetic inners (ie microfleece and suedecloth) so use with caution. Thanks to Lauren B. for pointing this out to us! Similar ingredients as other recipes, but in different amounts. Thanks to Lucinda A. for this recipe. "I tried the Essential Oils solution w/ tea tree, calendula , lavender,grapeseed ,ect. We love it! My daughter is highly highly sensitive to everything but this works wonders:) We use it for all kinds of stuff now, everyone loves the smell !! We use it every diaper change then coat w/ virgin 100% coconut oil - this combo has cleared up a super nasty rash over night!!! Thank you!!!" Raven R.
Dr Bronner's soaps can often be found in organic markets. Grapefruit seed extract and coconut oil are natural remedies for Candida, which can cause diaper rash. Thanks to Trish for this recipe. This concentrate is easy to make and lasts a long time. Fill a condiment bottle with equal amounts of baby oil and wash. To use: shake, then add 1-2 squirts of concentrate to 1 cup of water. Thanks to Haley J. for this recipe. Just one "something" of each ingredient for this recipe. Lavender and Tea Tree are popular EO choices for wipe solutions. Variation: Use lavender baby oil and lavender baby wash for a heavenly Lavender wash. Thanks to Nicole M. for this variation. Lanolin and glycerine moisturize without oil. Lansinoh can be found in many local stores. Baby lotion adds more softening power to this solution. 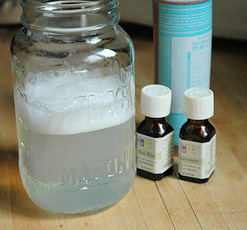 Variation: Replace the baby oil and lotion with 2 tablespoons Baby Magic Creamy Baby Oil for a less oily potion. Thanks to Kimberly A. for this variation. Baby Magic products are usually easy to find in local stores. Don't measure for this one, just estimate amounts. A great natural wipes solution. Some mamas have reported that the ratio of oil to baby wash in the recipe caused oil build-up on their diapers. You may want to halve the amount of oil or double the amount of baby wash.
Baby shampoo works as well as baby wash. This recipe relies on the EO to cleanse, instead of using soap. Witch hazel is the cleansing agent in this solution. Thanks to Candi B. of Wenatchee, WA. for submitting this recipe. This solution has a lovely lavender scent. Thanks to Amy V. for submitting this recipe. One of our favorites, the apricot oil smells heavenly! Our other favorite, the lavender is calming for us and our son. Here are a couple of links for more ideas on how to make and use your cloth wipe solution. Have fun seeing what others say about using cloth wipe solutions.